Issue 15 of The Nightwatchman is out now and available to buy here. And so another English season potters towards the close, door soon to be shut on the year, days to be noted down as history in Wisden’s mouse-print pages. We hope that this 15th issue of The Nightwatchman will help to keep you going over the shortening autumnal months, whether you are a new reader or a long-timer who enjoys the rhythm of the coloured spines lined up on the bookshelf. Hopefully there is something for everyone inside these pages, from history to politics via statistics and the more ethereal. And pieces by old friends and new. Two writers look back with affection on fellow scribes who inspired them. Patrick Symes remembers John Arlott, both the young cricket-mad fellow and the older more seasoned chap in the press box. Paul Edwards, a regular contributor of the thoughtful and the lovely, writes about the man who was his muse, the late great Alan Ross. 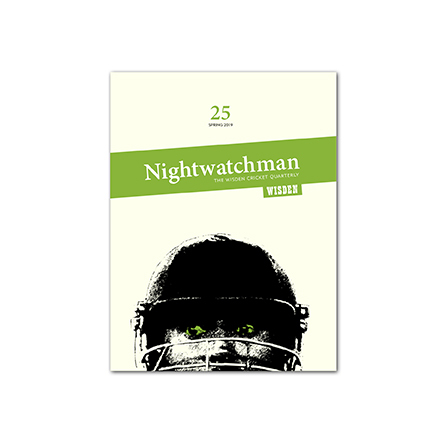 Want to get The Nightwatchman for the best possible price? Subscribe and get four issues a year for £29.95 + P&P. Elsewhere Suresh Menon ruminates on the oft-shattered glass of childhood cricket games, while Jon Harvey and Harry Pearson find inspiration in two of cricket’s more obscure parts – shouldering arms and that weapon of war, the beamer. And from opposite ends of the spectrum Alex Book tries to persuade readers of the truth of Cricket: The Brand while Richard Smyth finds solace in a wonderful piece of writing about memory. We also have Ben Falk on his battle with OCD and how it came to almost destroy his love of the game, while two of our writers track down men almost forgotten in the dust of time: Rob Smyth on Duncan Spencer, and Ashley Gray on Lawrence Rowe. And we let John Crace loose on Boris’s cricket match. Plus much more. We hope that you’ll find plenty to enjoy, something to inspire, make you smile or even prickle. And if you feel stirred to write or want to let us know your feelings about the magazine, good or bad, please get in touch with us at editor@thenightwatchman.net. We read every submission (but promise nothing) that fulfills our criteria: that pieces touch on cricket (however tangential) and are original, thought-provoking and beautiful. Like anything, cricket writing can grow stale – we welcome new voices, wherever they’re from. Enjoy these golden months – with change afoot in the national game as well as the air, take a moment to sit back and wonder. Happy reading.